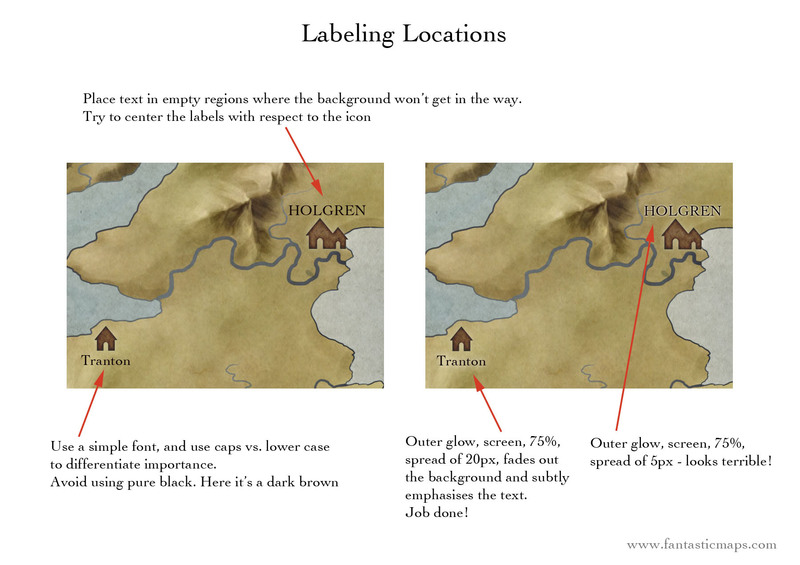 Today I’ll be covering labeling locations. So I won’t be handling titles, terrain labels, rivers or any of that. Basically, if it’s a place adventurers can pillage, this is how we’ll label it. Pick something easy to read. I know we all like Deutsche Gothic and Pieces of Eight, but save those fonts for your title. The labels should be in something clean and simple. Here I’ve used Cochin, which is a nice serifed font that’s a little unusual so doesn’t immediately scream ‘Times New Roman’ at the viewer. Use different font weights to designate different locations. You can also use different capitalization. For example, all caps for Capital Cities, small caps for other cities, and capitalized lower case for everything else. In the Character Dialog in Photoshop there’s a small caps option, which is a great thing to know about. Don’t use pure black. This I learned the hard way after doing the Midgard maps for Wolfgang Baur and Open Design. Black may read well on the screen, but it doesn’t always print well. Here I’ve used a deep saturated brown. I try to line up labels centered on the icon if I can. However, if there’s a lot of detail in the map, you want to move the label to the nearest uniform space. So, place the label over all forest, all plains, or all water. Try to avoid placing the text over a line, such as a forest edge, coastline or river. The line will mess up the lines of your text and make it hard to read. Flat text on a map looks, well, flat. I add a gentle glow to the text to help pull it out from the background. I’ve given two examples here – one that looks good, and one that looks terrible. The glow on Holgren is an outer glow, with blend mode set to Screen and opacity set to 75% and a size of 5px. It’s a very light yellow. You can see that the hard edge makes this look a bit nasty. Basically the sharp edge of the glow is competing with the sharp edge of the text, rather than complementing it. On Tranton, the glow is identical, but it has a size of 20px. This smoothes out the glow and has the effect of gently nudging the text out of the background. It’ll also knock out some of the background detail, making it easier to read a label above a more complicated piece of terrain. It’s a powerful technique, but can easily be over used! Be careful – in this case less is usually more. As always, throw any questions in the comments here and I’ll do my best to answer them. Feel free to share this around. More tutorials over on the tutorials page. 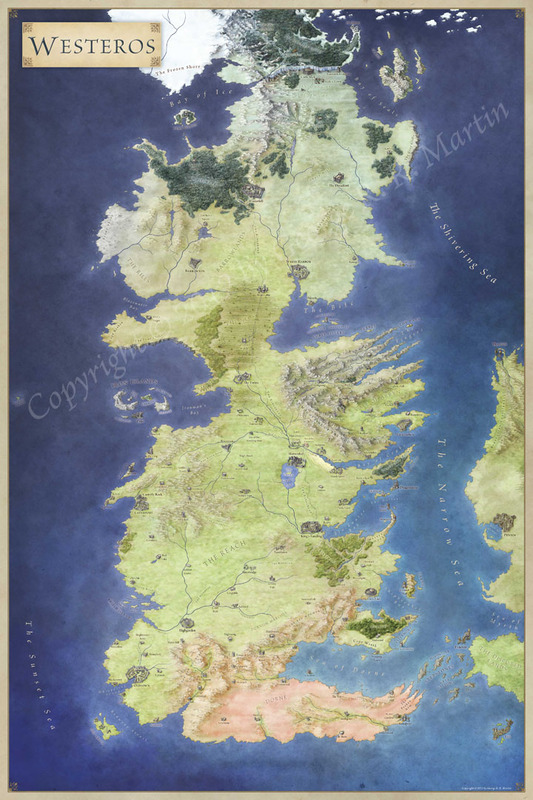 Oh, and the map and icons are the Iconic Island. Is it OK to use a CMYK mix for black? I’d expect that to reproduce well in print. The reason is more a matter of appearance. The black tends to stand out on a hand drawn map. It looks a little out of place. But you are also right. I tend to work in rgb and the conversion to cmyk for printing often doesn’t play well with hard black. As a prepress dude, I cringe when I think of 4-color text at map label sizes. If you’re able to do the labeling outside of the image app (place the Photoshop/GIMP file into Illustrator/Kontour or InDesign/Scribus), using pure black overprinting text (that’s actually text and not pixels) makes for both a clean look and an easier print. Interesting point. For a lot of maps, the text is intrinsically tied into the map itself, rather than truly sitting on a layer above the map. For example, I often have text built up with a combination of layer blend modes, and with masks on both the text and the layers beneath to have the text blend into the map. Recreating that with InDesign over a flat image would be impossible. Is the argument that the pixelation would degrade the crisp text too much on printing? Is there a dpi where raster catches up with native type? Well… the dpi where raster “catches up” with native type is the resolution of the platesetter, which is usually around 2400 dpi. The other issue you end up seeing with very small 4-color raster type is that the screen angles of the different inks end up making an even more raggedy edge. Note that I’m talking about final font sizes of less than 6 pts. Anything larger than that should look fine with modern printing. If your goal is to have the text “blend into” the map, by all means keep the effects and everything in Photoshop. I’m just letting you know what the difficulties end up being on my end. Granted, most of the maps I end up seeing printed are vector – like parks and cities on modern folding maps – so it’s a different beast. I very rarely use anything less than 6pt on maps. My backgrounds are almost always darker than normal maps so it needs the larger font size to maintain legibility. What about curving, sideways text on a mountain range or ocean? Is there an easy way to do this in Gimp/Photoshop or is there a separate (free) program you’d recommend? I’m just starting to think about doing text digitally for the first time. Always did it by hand until now. In photoshop yu can do this with the Warp tool (it looks like warped text on the text toolbar). You can also rotate straight text with the mouse. Another option is to lay a path, and then use the type tool on the path. Like magic – the text will follow the path (though, like magic, this take a little care to get right). Previous Previous post: Quick Mountain Tutorial!